The most startling information on the subject that we found is the lack of appropriate labeling of the dangerous chemicals that are in these products. In the fall of 2012, the Environmental Working Group released their "Cleaners Database Hall of Shame." According to a press release on the study, "Just 7 percent of cleaning products adequately disclosed their contents. To uncover what’s in common household cleaners, EWG’s staff scientists spent 14 months scouring product labels and digging through company web sites and technical documents. EWG staff reviewed each ingredient against 15 U.S. and international toxicity databases and numerous scientific and medical journals." Another startling finding of the study showed that several brands what is called "greenwashing" to trick consumers into buying products that they think are safe. For example, Simple Green Concentrated All-Purpose Cleaner is labeled “non-toxic” and “biodegradable,” yet it contains 2-butoxyethanol, a solvent absorbed through the skin that damages red blood cells and irritates eyes; a secret blend of alcohol ethoxylate surfactants, some of which are banned in the European Union." Among the other more obvious products that clearly label their inherent dangers, they also warn against "Mystery Mixes" such as Target's Up & Up and Wamart's Great Value cleaning products. According to the report, "Ingredient labels are mandatory for food, cosmetics and drugs--but not for cleaners. Bowing to pressure from customers and to the threat of federal regulation, most companies list some ingredients on labels and web sites or in worker safety information. But a few companies disclose nothing. Others may list one or a few ingredients or use vague terms like 'surfactant' or 'solvent.'" So keep your eyes peeled for these words when scanning the ingredients list, and if there is nothing listed, the EWG says "No information could mean something to hide." Finally, if you are concerned about having harmful cleaning products in your home, do what makes sense! The EWG suggests that consumers "Read labels carefully and pay special attention to warnings. Don’t buy any products labeled 'poison,' 'danger' or 'fatal' if swallowed or inhaled." And remember, there are many ways these products can affect your health, some more obvious than others. According to the National Library of Medicine, "Toxic substances in [certain cleaning] products can cause harm if inhaled, swallowed, or absorbed through the skin. People respond to toxic substances in different ways. At high doses a toxic substance might cause birth defects or other serious problems, including brain damage or death." So, there are several ways they can enter your body and cause harm, and there are several different symptoms of that harm--some that might not be detectable until long after you have actually come into contact with the substance, and while that might be manageable for a house without children, what is most disturbing is the fact that these noxious chemicals are not completely necessary to their cause. Everyday liquid soap (find a natural brand, Dawn) kills 99.9% of harmful bacteria. A simple rubbing alcohol and water solution (1 part alcohol, 2 parts water) will take care of the rest. The remaining alcohol residue evaporates almost instantly, leaving nothing behind but H2O. So why do we think that we need the products that contain dangerous ingredient? It's like combating gun violence with bombs--it just doesn't make sense. Read those labels and decide for yourself: are the risks of this product worth the results they achieve? Will this product help improve wellness in my household? Do I fully understand what is in this product and what that means? If you answered "no" to any of these questions, then it's probably best to put that product back up on the store shelf. One last thing before we go. Did you know you can use ketchup to remove tarnish from copper pots? Or that lemon juice and baking soda can be used to scrub the bathroom tile? What about vinegar to clean and remove mildew on wooden floors? 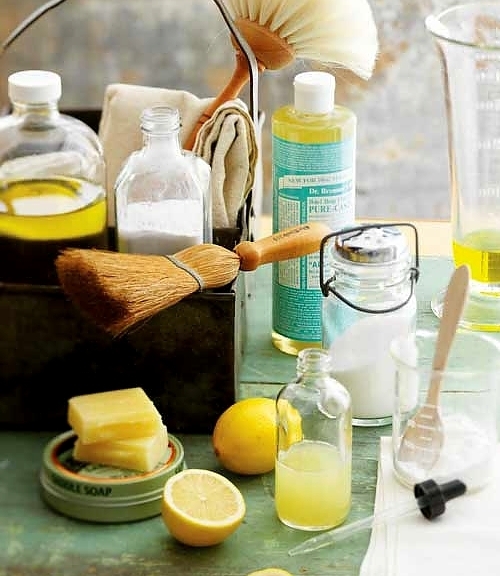 Real Simple magazine's list of "66 All-Natural Cleaning Solutions" has some great recipes for affordable DIY household cleaners. Give them a try, let us know what you think, and if you have any green recipes of your own, please feel free to comment and share! The Scoop: Are GMOs Safe? Recently a lot of controversy has surrounded the subject of GMOs. A line has been drawn, a battle is about to ensue but amidst the varying news sources, it's sometimes hard to know what to believe. So, we did some research. "The food industry has a choice to make: stand with the chemical companies or stand with its consumers." More than 20 countries around the world flat out banned GMOs, didn't introduce them at all. The reasons vary, from no long-term human health studies and no synergistic toxicity studies (eating a pesticide sprayed with other weed killers, anyone?) to no prenatal studies and concerns over everything from cancer to allergies. We also found an article in The Washington Post that studied the points GMO supporters and opponents actually agree upon. They found three items that even the food industry cannot refute. First, that "GMOs have contributed to the rise of herbicide-resistant weeds and pesticide-resistant insects." And while it is well known that resistance would happen regardless of GMOs, the ecological effects of this phenomena are yet to be seen, and certainly ominous. Second, they found that "Most of the benefits of GMOs accrue to biotech firms and farmers, leaving little to balance consumers’ assessment of risks." So just to be clear now--even the food industry agrees, this isn't about "feeding the world," it's about turning a profit, and is simply another case of economic shortsightedness in our society--the person making the profit has decided that the short-term rewards outweigh the long-term costs of their practices. Finally, they found that, "We need to evaluate GMOs on a case-by-case basis." The bottom line is, we don't know how GMOs are going to affect us physiologically, because they haven't been around that long. It is not unfathomable that some might be worse that others. All this being said--regardless of whether or not you personally are willing to consume food with GMOs--it is time that we start demanding our right to know what is in our food. From there, it is up to each of us as individuals to decide what we put in our bodies. The answer is simple: you vote with your dollars each time you shop at the grocery store--so make an informed decision. An easy way to do this is to look for products that clearly label that they do not use GMOs; food companies that have gotten onboard with the non-GMO movement are wisely marketing their products and boosting their sales by letting consumers know where they stand. Not sure if a product has GMOs in it? We went to the non-GMO Project's website and found this list where you can browse non-GMO products by brand. By buying only non-GMO products not only are you ensuring the health and safety of yourself and your family, but you are telling the companies that control the food in our country that they need to change their ways if they want to survive. It's so funny how powerless the average person feels about this issue, yet we alone have the power to change the profit margins that make it worthwhile for these companies to continue to not label and use GMOs. 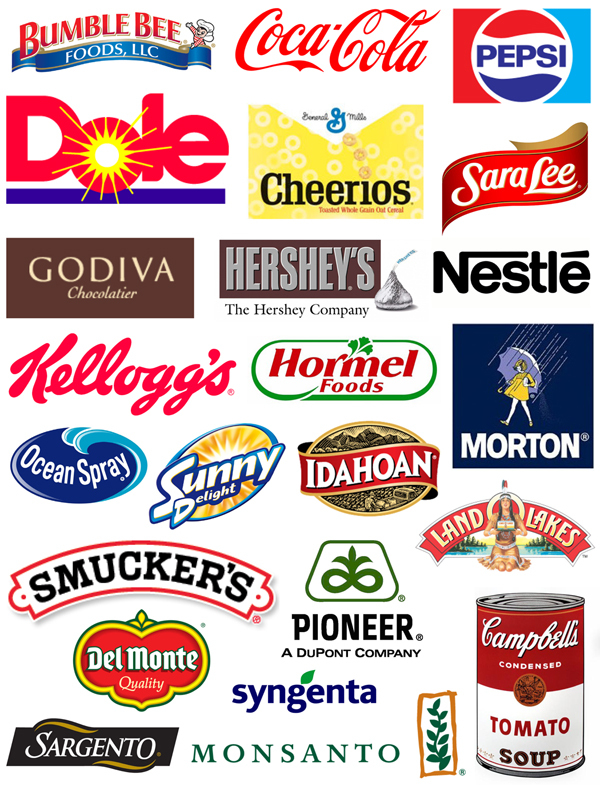 Before we go, we wanted to leave you with a brief look at some of the companies that are working hard to keep the FDA from requiring GMO labeling. It is unfortunate that the brands that we all grew up with have refused to ensure that their "new and improved" products are safe for consumption, but we must be aware that they should no longer be considered "household names." It is time to let these companies know that we do have the power to change this situation--by changing our minds about what we are willing to put in our bodies. Phthalates. You may not know how to pronounce this word, but you should definitely know the meaning. According to WebMD phthalates are "chemicals used to make products more pliable. They're found in toys, food packaging, and some beauty products, including nail polish, shampoo, and soap. Two studies suggest phthalate exposure during pregnancy may lead to abnormal development in male infants, including low hormone levels and small genital size. But the FDA says there is "not enough evidence to conclude that phthalates pose a health risk." Because there is no FDA regulation on these products, many other health organizations are raising questions about the long-term effects of the use of phthalates, and whether or not they can trigger disease. For example, the Breast Cancer Action organization stated that phthalates "are also known to be hormone-mimicking chemicals, many of which disrupt normal hormonal processes, raising concern about their implications for increased breast cancer risk," and the Huffington Post reports that according to a study done at Uppsala University, "those with higher levels of phthalates in their blood were twice as likely to develop diabetes than those with lower levels of the plastic chemical in their blood." Finally, according to the National Center for Biotechnology Information"...makeup, shampoo, skin lotion, nail polish, and other personal care products contain chemical ingredients that lack safety data," and that "often [phthalates'] presence is not noted on labels." How do you know if your beauty products contain phthalates? According to Breast Cancer Action, "All U.S. cosmetics and personal care products are required to list their ingredients in order of their relative quantity, with the most frequently used ingredient listed first. However, any ingredients used in fragrances or mixtures are considered trade secrets and are exempt from these requirements. Phthalates are frequent components of fragrances, which often contain dozens of chemicals. The entire mixture simply appears as “fragrance” on the ingredient list. Thus, a product may include phthalates that are not listed on its label." So what can we do to avoid using phthalates if they are not labeled on products? First off, you can check and see if your beauty product company made Breast Cancer Action's list for Phthalate free cosmetics here. If it is not on the list, Breast Cancer Action recommends that you contact your beauty product company by email or phone and ask them if your particular product contains phthalates. And the moral of the story? Start being more aware of what you are putting on your body--the lack of regulation in beauty care products has plenty of loopholes that can put consumers at risk--educate yourself and be protected.